Brad DeLong has suggested that we rename the Great Recession the GreatER Depression in Europe as the crisis in terms of real GDP lose now is bigger in Europe than it was it during the Great Depression. Surely it is a very simplified measure just to look at the development in the level of real GDP and surely the present socio-economic situation in Europe cannot be compared directly to the economic hardship during the 1930s. That said, I do believe that there are important lessons to be learned by comparing the two periods. In my post from Friday – Italy’s Greater Depression – Eerie memories of the 1930s – I inspired by the recent political unrest in Italy compared the development in real GDP in Italy during the recent crisis with the development in the 1920s and 1930s. The graph in that blog post showed two things. First, Italy’s real GDP lose in the recent crisis has been bigger than during 1930s and second that monetary easing (a 41% devaluation) brought Italy out of the crisis in 1936. I have been asked if I could do a similar graph on Finland. I have done so – but I have also added the a third Finnish “Depression” and that is the crisis in the early 1990s related to the collapse of the Soviet Union and the Nordic banking crisis. The graph below shows the three periods. The most interesting story in the graph undoubtedly is the difference in the monetary response during the 1930s and during the present crisis. In October 1931 the Finnish government decided to follow the example of the other Nordic countries and the UK and give up (or officially suspend) the gold standard. The economic impact was significant and is very clearly illustrate in the graph (look at the blue line from year 2-3). We have nearly imitate take off. I am not claiming the devaluation was the only driver of this economic recovery, but it surely looks like monetary easing played a very significant part in the Finnish economic recovery from 1931-32. Contrary to this during the recent crisis we obviously saw a monetary policy response in 2009 from the ECB – remember Finland is now a euro zone country – which helped start a moderate recovery. However, that recovery really never took off and was ended abruptly in 2011 (year 3 in the graph) when the ECB decided to hike interest rate twice. 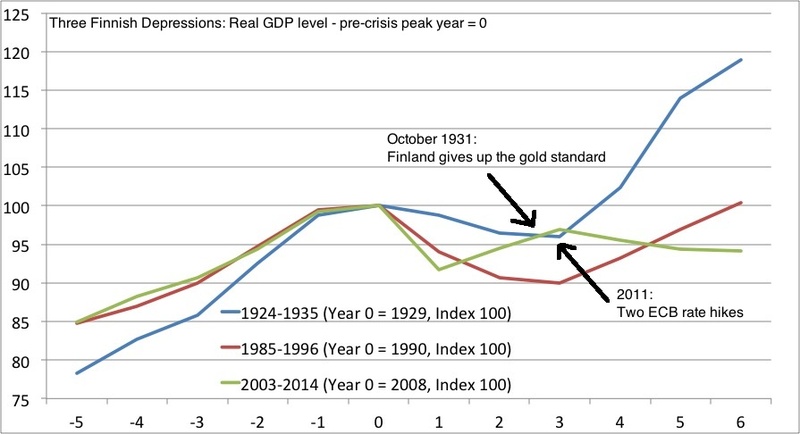 So here is the paradox – in 1931 two years into the crisis and with a real GDP lose of around 5% compared to 1929 the Finnish government decided to implement significant monetary easing by devaluing the Markka. In 2011 three years into the present crisis and a similar output lose as in 1931 the ECB decided to hike interest rates! Hence, the policy response was exactly the opposite of what the Nordic countries (and Britain) did in 1931. The difference between monetary easing and monetary tightening is very clear in the graph. After 1931 the Finnish economy recovered nicely, while the Finnish economy has fallen deeper into crisis after the ECB’s rate hikes in 2011 (lately “helped” by the Ukrainian-Russian crisis). Just to make it clear – I am not claiming that the only thing import here is monetary policy (even though I think it nearly is) and surely structural factors (for example the “disappearance” of Nokia in recent years and serious labour market problems) and maybe also fiscal policy (for example higher defense spending in the late-1930s) played role, but I think it is hard to get around the fact that the devaluation of 1931 did a lot of good for the Finnish economy, while the ECB 2011’s rate hikes have hit the Finnish economy harder than is normally acknowledged (particularly in Finland). Concluding, in terms of real GDP lose the present crisis is a GreatER Depression than the Great Depression of the 1930s. However, it is not just greater – in fact it is the GreatEST Depression and the output lose now is bigger than during the otherwise very long and deep crisis of the 1990s. My friend professor Steve Horwitz has a very good offer for students. He is offering an eight-week long program on the Great Depression at the Learn Liberty Academy. Starting next month, I will be teaching an eight-week long program on the Great Depression for my friends at the Learn Liberty Academy, which is part of the Institute for Humane Studies‘ Learn Liberty project. If friends or students you refer to the program register and mention your name as having referred them, you’ll get an Amazon gift card, and you’ll get another if they complete the full program. So, faculty and student readers of BHL, please feel free to pass this info on to your students and friends and have folks sign up. It’s going to be a really great program! Steve and I do certainly not agree on everything about the Great Depression, but Steve has done a lot of work on the Great Depression and is an extremely clever economist and monetary theorists so I strongly recommend to any student to check out Steve’s offer. See more on the “Making Sense of the Great Depression” program here. PS Now Steve send me some books! Yesterday I was surfing the internet for some information on events in 1937 – the year of the Recession in the Depression. While doing that I found a great lecture Scott Sumner did at Oxford Hayek Society in 2010. Scott’s lecture basically is a wrap-up of his forthcoming book on the Great Depression. Scott tells me the book likely will be published later this year. I have had the pleasure and honor of reading a draft of the book. You all have have something to look forward to – it is a great book! The thesis in Scott’s book is that the Great Depression in the US was a combination of two shocks. A negative demand shocks – excessive monetary tightening – and a series of negative supply shocks caused by Roosevelt’s New Deal policies particularly the National Industrial Recovery Act (NIRA) and the Wagner Act. His arguments are extremely convincing and I believe that you cannot understand the Great Depression without taking both these factors into account. Scott does a great job showing that policy failure – both in the terms of monetary policy and labour market regulation – caused and prolonged the Great Depression. Hence, the Great Depression was not a result of an inherent instability of the capitalist system. Unfortunately policy makers today seems to have learned little from history and as a result they are repeating many of the mistakes of the 1930s. Luckily we have not seen the same kind of mistakes on the supply side of the economy as in the 1930s, but in terms of monetary policy many policy makers seems to have learned very little. I therefore hope that some of today’s policy makers would take a look at Scott’s lecture. You can watch it here. Scott has kindly allowed me also to publish his PowerPoint presentation from the lecture. You can find the presentation here. And for those who are interested in studying the disastrous labour market policies of the Rossevelt administration I strongly recommend the word of Richard Vedder and Lowell Gallaway – particularly their book “Out of Work”. Furthermore, I would recommend Steve Horwitz’s great work on President Hoover’s policy mistakes in the early years of the Great Depression. The Japanese stock market dropped more than 7% on Thursday and even though we are up 3% this morning there is no doubt that “something” had scared investors. There are likely numerous reasons for the spike in risk aversion on Thursday, but one reason is probably that investors are getting concerned about the Federal Reserve and the Bank of Japan getting closer to scaling back monetary easing. That has reminded me on what happened in 1937 – when market participants panicked as they started to fear that the Federal Reserve would move prematurely towards monetary tightening – after the US economy had been in recovery since FDR took the US off the gold standard in 1933. Going into 1937 both US government officials and the Fed officials started to voice concerns about inflationary pressures, which clearly sent a signal to market participants that monetary policy was about to be tightened. That caused the US stock market to slump and sent the US economy back into recession – the famous Recession in the Depression. At the core of this policy mistake was the fact that the fed had never clearly defined and articulated a clear monetary policy target after going off the gold standard in 1933. The situation in many ways is similar today. Market participants in general know that the fed is likely to scale back monetary easing when the US economy “improves”, but there is considerable uncertainties about what that means and the fed still has not clearly articulated its target(s). Furthermore, the fed continues to be very unclear about its monetary policy instruments. Hence, the fed still considers the fed fund target rate as its primary monetary policy instrument while at the same time doing quantitative easing. These uncertainties in my view certainly make for a much less smooth ‘transition’ in monetary policy conditions in the US. Therefore, instead of focusing on when to scale back “QE” the fed should focus 100% on explaining its target so nobody is in doubt about what the fed really is targeting. Furthermore, the fed needs to stop thinking and communicating about monetary policy in terms of interest rates. The money base and not the interest rate is the key monetary policy instrument in the US and it is about time that the fed acknowledges this. The best way of getting rid of these monetary policy uncertainties is for the fed to first of all give an explicit nominal target. Preferably the fed should simply state that it will conduct monetary policy in a way to increase nominal GDP by 15% in the coming two years and thereafter target 5% annual NGDP growth (level targeting). Second, the fed then should become completely clear about its monetary policy. The best thing would be a futures based NGDP targeting. See here for a description about how that would work. Alternatively the fed should clearly spell out a ‘reaction function’ and clearly describe its monetary policy instrument – what assets will the fed buy to expand or contract the money base? It is really simple, but so far the fed has totally failed to do so. Japanese monetary policy has become a lot clearer after Haruhiko Kuroda has become Bank of Japan chief, but even the BoJ needs to work on its communication policy. Why is the BoJ not just announcing that since it now officially has a 2% inflation target it will ‘peg’ the market expectations for example for 2-year or 5 year (or both) inflation at 2% – and hence simply announce a commitment to sell or buy inflation-linked bonds so the implicit breakeven inflation is 2% on all time horizons at any period in time. This is of course a set-up Bob Hetzel long ago suggested for the fed. Maybe it is time the BoJ invited Bob back to for a visit in Japan? If the fed and the BoJ in this fashion could greatly increased monetary policy transparency the markets would not be left guessing about what they central banks are targeting or about whether there will be a sudden redrawl of monetary policy accommodation. Thereby it could be ensured that the scaling back of monetary easing will happen in a disorderly fashion. There is not reason why we need repeating the mistakes of 1937. Both David Glasner and Marcus Nunes have related posts. See also here if you want to read what I wrote about the Japanese “jitters” yesterday in my day-job. When crisis hit in 2008 it was mostly called the subprime crisis and it was normally assumed that the crisis had an US origin. I have always been skeptical about the US centric description of the crisis. As I see it the initial “impulse” to the crisis came from Europe rather than the US. However, the consequence of this impulse stemming from Europe led to a “passive” tightening of US monetary conditions as the Fed failed to meet the increased demand for dollars. The collapse in both nominal (and real) GDP in the US and the euro zone in 2008-9 was very similar, but the “composition” of the shock was very different. In Europe the shock to NGDP came from a sharp drop in money supply growth, while the contraction in US NGDP was a result of a sharp contraction in money-velocity. The graphs below illustrate this. The first graph is a graph with the broad money supply relative to the pre-crisis trend (2000-2007) in the euro zone and the US. The second graph is broad money velocity in the US and the euro zone relative to the pre-crisis trend (2000-2007). 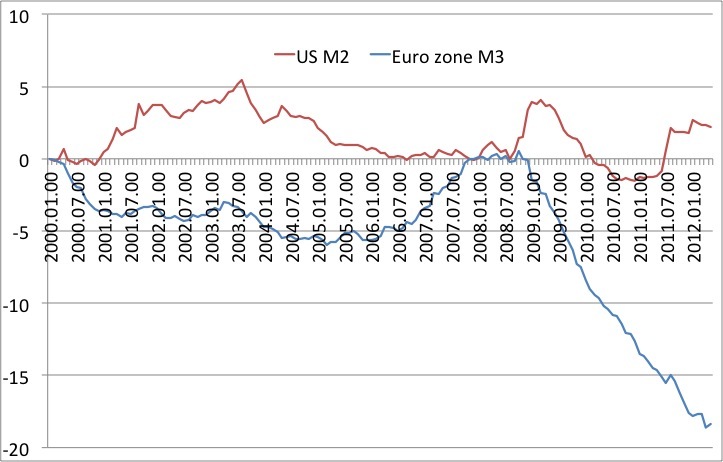 The graphs very clearly illustrates that there has been a massive monetary contraction in the euro zone as a result of M3 significantly undershooting the pre-crisis trend. Had the ECB kept M3 growth on the pre-crisis trend then euro zone nominal GDP would long ago returned to the pre-crisis trend. On the other hand the Federal Reserve has actually been able to keep M2 on the pre-crisis path. However, that has not been enough to keep US NGDP on trend as M2-velocity has contracted sharply relative the pre-crisis trend. Said in another way a M3 growth target of for example 6.5% would basically have been as good as an NGDP level target for the euro zone as velocity has returned to the pre-crisis trend. However, that would not have been the case in the US and that I my view illustrates why an NGDP level target is much preferable to a money supply target. Not surprisingly the focus of the discussion of the causes of the crisis often is on the US given both the subprime debacle and the collapse of Lehman Brothers. However, I believe that the shock actually (mostly) originated in Europe rather than the US. What happened in 2008 was that we saw a sharp rise in dollar demand coming from the European financial sector. This is best illustrated by the sharp drop in EUR/USD from close to 1.60 in July 2008 to 1.25 in early November 2008. The rise in dollar demand is obviously what caused the collapse in US money-velocity and in that regard it is notable that the rise in money demand in Europe primarily was an increase in demand for dollar rather than for euros. This is why I stress the European origin of the crisis. However, the cause of the crisis nonetheless was a tightening of US monetary conditions as the Fed (initially) failed to appropriately respond to the increase in dollar demand – mostly because of the collapse of the US primary dealer system. Had the Fed had a more efficient system for open market operations in 2008 then I believe the crisis would have been much smaller and would have been over already in 2009. As the Fed got dollar-swap lines up and running and initiated quantitative easing the recovery got underway in 2009. This triggered a brisk recovery in both US and euro zone money-velocity. 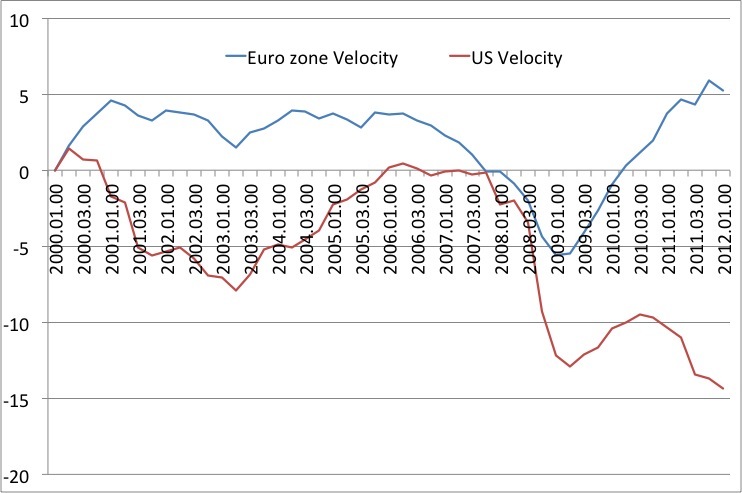 In that regard it is notable that the rebound in velocity actually was somewhat steeper in the euro zone than in the US. The crisis might very well have ended in 2009, but new policy mistakes have prolonged the crisis and once again European problems are causing most headaches and the cause now clearly is that the ECB has allowed European monetary conditions to become excessively tight – just have a look at the money supply graph above. Euro zone M3 has now dropped more than 15% below the pre-crisis trend. This policy mistake has to some extent been counteracted by the Fed’s efforts to increase the US money supply, but the euro crisis have also led to another downleg in US money velocity. The Fed once again has failed to appropriately counteract this. In the discussion above I have tried to illustrate that we cannot fully understand the Great Recession without understanding the relationship between US and euro zone monetary policy and I believe that a full understanding of the crisis necessitates a discussion of European dollar demand. Furthermore, the discussion shows that a credible money supply target would significantly have reduced the crisis in the euro zone. However, the shock to US money-velocity shows that an NGDP level target would “perform” much better than a simple money supply rule. The conclusion is that both the Fed and the ECB have failed. The Fed failed to respond appropriately in 2008 to the increase in the dollar demand. On the other hand the ECB has nearly constantly since 2008/9 failed to increase the money supply and nominal GDP. Not to mention the numerous communication failures and the massively discretionary conduct of monetary policy. Even though the challenges facing the Fed and ECB since 2008 have been somewhat different in nature I would argue that proper nominal targets (for example a NGDP level target or a price level target) and better operational procedures could have ended this crisis long ago. My previous post on Ferguson’s and Roubini’s FT piece about the lessons from 1932 reminded me that I actually have done quite a bit of blog posts on 1931-33 myself. Both about the actual events of those years and about what policy lessons these events should have for today’s policy makers.